As women, the physicians at Mission Obstetrics and Gynecology understand how stressful the idea of surgery can be. That’s why we use state-of-the-art, computer-assisted robotic technology to make surgical treatments as minimally invasive and painful as possible. In this age of advanced technology, invasive surgery requiring large incisions is no longer necessary for certain gynecological conditions. Instead, there is a minimally invasive option using miniaturized robotic surgical instruments that fit through much smaller incisions. 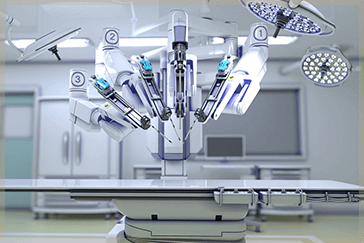 The most advanced of these surgical robots is the da Vinci® Surgical System Si. It consists of four robotic arms, one of which contains a magnified 3D camera designed to guide the gynecologic surgeon during the procedure. Controlled from a console, these instruments and camera enable the surgeon to see inside the patient on a stereoscopic, high-definition monitor while operating. The da Vinci system provides surgeons with a more detailed view of the operating site as well as maximum range of motion and precision. Gynecology procedures we can perform with computer-assisted robotic technology include hysterectomy, fibroid removal, pelvic prolapse surgery, and endometriosis resection, which spares the uterus and allows women to continue childbearing. At Mission OB GYN, your comfort and sense of well-being are our highest priorities. Our female doctors can discuss your surgical options and guide you each step of the way, from diagnosis to recovery. Call (586) 574-1313 to schedule your appointment today or you can request one online.